Calcurt Shelties and Himalayans live as part of our family. They don't really read our books, but they love to be near us so the living room is a favorite perch. 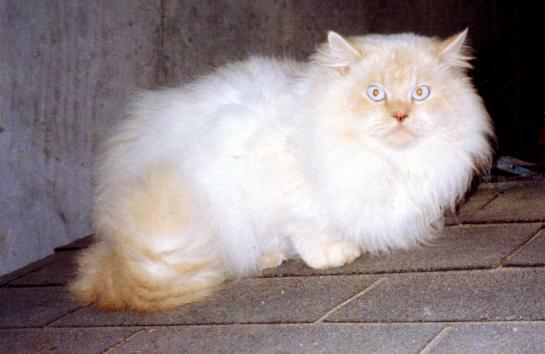 Tiger born Feb. 1990 was our third Himalayan but the first boy so that started our breeding cats. Calcurt Shelties had been around since the '60's but were really on hold when our children were busy with High School and college activities. When I decided to breed Himalayan cats in 1990, it seemed time to become more active with the Shelties, too. So Carry and Rory joined us as pups in the fall of 1990. Carry unfortunately died of cancer in 1997. She was a wonderful companion with many of the qualities we value; sweet steady disposition, lovely expression, excellent balanced angulation for effortless movement. She is sorely missed but fortunately left her daughter Calcurt Copper Cameo (Brandy) by Rory. Brandy's daughter Calcurt Circle of Life (Sheba) full sister to Calcurt Fawnwood Lion King (Toby) gave us Calcurt Step Into The Sun (Hana) also by Rory. This is our link to Calcurt Cutty Sark Sail by Ch.Macdega Sausalito. You can see Rory and Toby in first Sheltie section as the link roots below the pup and kitten picture. Poor Tiger! Here the page was named for him and got into those darn Shelties again. That's the way things tend to go on here. Shelties and Himmies tolerating each other (note Carry trying to ignore Tiger). We love them all and they really do get along well. Tiger thought he deserved more time so this addition is his tribute. When he was purchased he was four months old, a present for my June birthday. He was listed as flame point and full of beans so I thought he had a tiger personality and assumed he would have orange points. I chose the name from the famous poem "Tiger, tiger, burning bright...". This was the beginning of Tiger doing things his own way; he ended up cream point and has mellowed into a real couch potatoe. Although his father was a blue point (and mother chocolate-tortie point, hence the dilution that produced his cream), Tiger never produced a blue with our tortie point, Calcurt Samantha Sparkler (Sam). He did have blue points and blue-cream points from our blue point Hennis Alycle Blue of Calcurt (Alyce). As an unaltered male, he was a marvelous housepet and slept on our bed (or by the fireplace no matter how hot or anyplace else as you can see from the picture). I think he thought he owned us as you can tell from the expression in the first photo. He used to go for walks on a harness and retracting leash but got so mad at me when I brought him in (no matter how long the walk) that I finally decided it wasn't worth the effort. He was the only one of our Himmies that got a lumpy coat (no matter how hard I tried to brush it out) but he hated the bath and shaving that he once had to fix it. He used to pull out the lumps by himself which left him rather bald for a while but prevented the indignity of human manipulation. In his older age he was more cooperative and put up with an annual professional grooming with frequent brushing at home. Beauty has it's price and "Iggie" learned to pay. He was the center of our cat family and we miss him a lot.